– Inspection of Marine Platforms substructures. – Removal of metallic debris that is in contact with the substructure of the Platforms. – Placement of sacks of cement-sand to a depth of 60 meters. – Installation of sacrificial anodes. – Electric Puenteos on metal clamps and sacrificial anodes. – Dismantling and installation of pipeline defenses and defenses Leg Platforms. – Replacement of asparagus duct clamps of different diameters and depths. – Removal of marine growth with manual tools (scrapers). – Construction and installation of brackets cemented on different nodes. – Strengthening of structural elements injected cement platforms to the structure at a density of 1.90 g/cm3, with a minimum compressive strength of 105 Kg/Cm2 to 24 hrs. and 200 kg/cm2 after 28 days. – Manufacture, transport and anchoring mooring buoys. – Installation of Pipe, Valves and Flanges carbon steel. – Radiographic Inspections with gamma rays at 100% for pipes of different diameters. – Hydrostatic testing of pipelines of different diameters. – Cleaning sandblasted to white metal to metal surfaces. – Application based primary inorganic zinc RP-4B, 100% solvent-based self-healing 2.5 to 3.0 mils. thickness to metal surfaces. – Application of finish coating anticorrosive epoxy high solids catalyzed RA-26 specifications at metal surfaces. – Application of polyurethane finish specifications RA-28 to metal surfaces. – Application of Epoxy Coating at Area tides and waves. – Magnetic inspection to detect cracks or cracks in the welds of structural members Particles platforms. – Inspection of Welding with digital ultrasound equipment. – Equipment Inspection with A.C.F.M. the welds in order to detect microcracks in the welding of the structural members. – Thumbnail Grid Fiberglass and steel grid platforms. 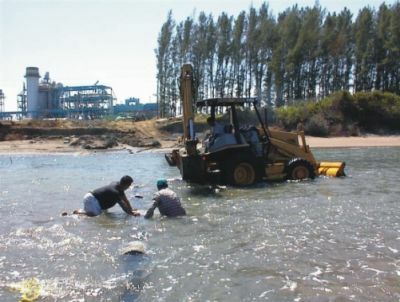 LAYING PIPES AND INSTALLATION OF EFFLUENT DISCHARGE OCEAN CHEMICAL INDUSTRY. – Application of RP-4B in carbon steel pipe of different diameters. – Supply and fusing HDPE pipe SDR in different diameters. – Jacketed pipe H.D.P.E. SDR with carbon steel pipe of different diameters. – Placement of tanks, attached to the pipe with strip 1 “lingadas. – Fabrication of Emitter effluents of different diameters. – Positioning of ship on shore to pull the pipe out to sea. 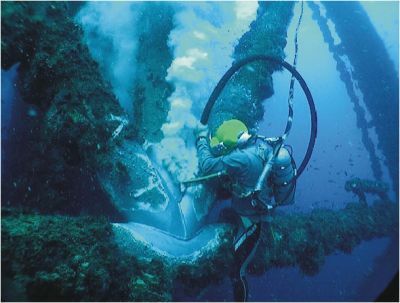 – Placement of diffuser pipe support staff Diving ..
– Placement of cement-sand sacks. – Manufacture and mortar Thumbnail counterweights. – Placement of Anchors stingray type. – Hydrostatic Testing of Piping H.D.P.E. – Dredging of Navigation Channels in different types of material ya different depths. – Conformation embankments with dredged material products. – Growth of marine Limpieza within pipes, suction and discharge. – Dredging Channel of Llamada with Suction dredger. – Calibration of thickness in pipes and Suction Download. – Ultrasound Inspection with the welds Suction pipes and Download. – Inspection with A.C.F.M. the welds pipe Suction and Download. – Inspection with photo and video underwater pipes to suction and discharge, gates, channels of llamada, etc..
– Dismantling of heavy and medium structures. – Excavating Hand Tool and Equipment. – Elaborations F’C hydraulic concrete = 150 kg/cm2. – Construction of concrete mochetas. – Placing Doors and Windows Aluminium. – Placement of toilets and accessories. – Manufacture and assembly of Medium and heavy steel structures. – Manufacture and installation of metal gates. – Introduction to electrical cable duct. – Installation of Conduit pipe. – Installing electrical boxes and covers registration. – Installation of electrical switches. – Handling and erection of steel pipes of different diameters. – Cortes, beveled and welding steel pipe of different diameters. – Manufacture of curves with straight steel pipe bent cold. – Installation of coving PRC of different measures. – Installation of flanges, valves, elbows, tees. – Hydrostatic testing to heads. – Decommissioning of metal tanks with oxyacetylene cutting equipment. – Removal of metal structures. – Rolling of plates and profiles. – Beveled laminated carbon steel. – Mounts, armed soldiers and testing line, dome, body and structure fixed dome cylindrical tanks of different capacities. – Installation of hinged covers to trap devils in different diameters. – Placement of carbon steel anchors of different diameters. – Abrasive cleaning to white metal. – Application of Primary Organic Zinc coatings (RP-4), on flat surfaces, pipes, valves, elbows and tees of different diameters. – Application of epoxy finish. (RA-26), on flat surfaces, pipes, valves, elbows and tees of different diameters. – Application of Polyurethane. (RA-28), on flat surfaces, pipes, valves, elbows and tees of different diameters. – Application of catalyzed epoxy resin, pipes, valves, elbows and tees of different diameters. – Polls open for locating pipes in operation in order to avoid being damaged by construction work sky. – Electromechanical detection pipelines within rights of way. – Openings gaps manually and machinery. – Movements fiberglass pipes and steel. – Links of fiberglass pipe and cut and welded steel pipe. – 100% radiographic Solder joints in pipes of different diameters inspections. – Solder type chamfer or fillet structural profiles. – Jacketed Piping in different diameters. – Lowered in ditches pipes of different diameters. – Construction of tunnels for pipelines crossing roads.